We have one of the largest selections of backcountry ski and backcountry snowboard equipment on the web, a super knowledgable staff and expert guides to help you make an informed decision. What gear do I need to splitboard? What information should I arm myself with before venturing out into the backcountry? Sick of lift lines on pow days? 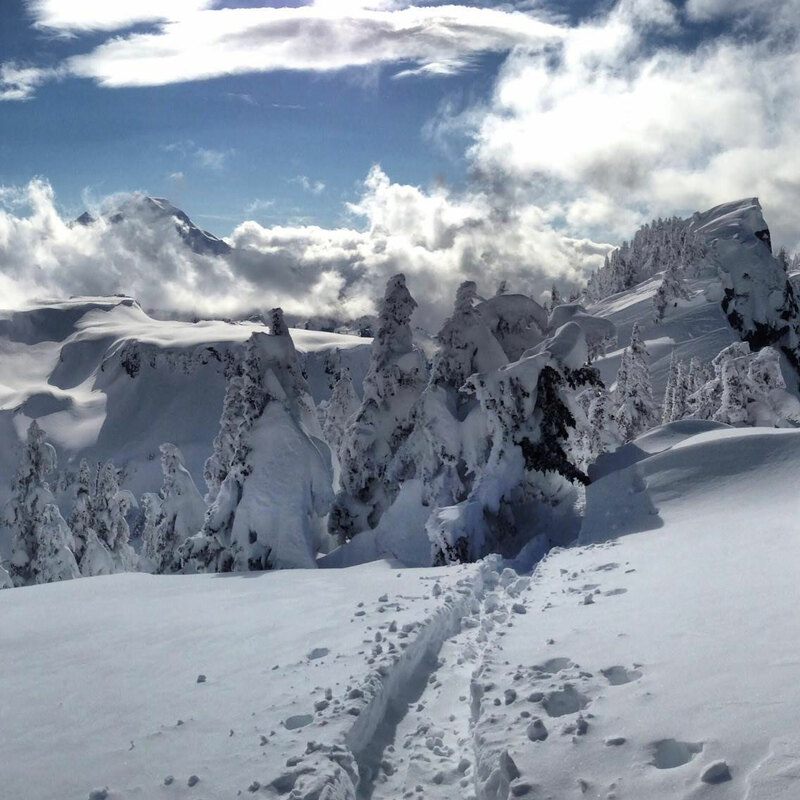 Ready to explore the vast backcountry in search of the perfect line? Taking on the challenge of earning turns all 12 months of the year? If you answered yes and you don’t want to give up the freedom of riding a snowboard, welcome to the wonderful world of splitboarding. 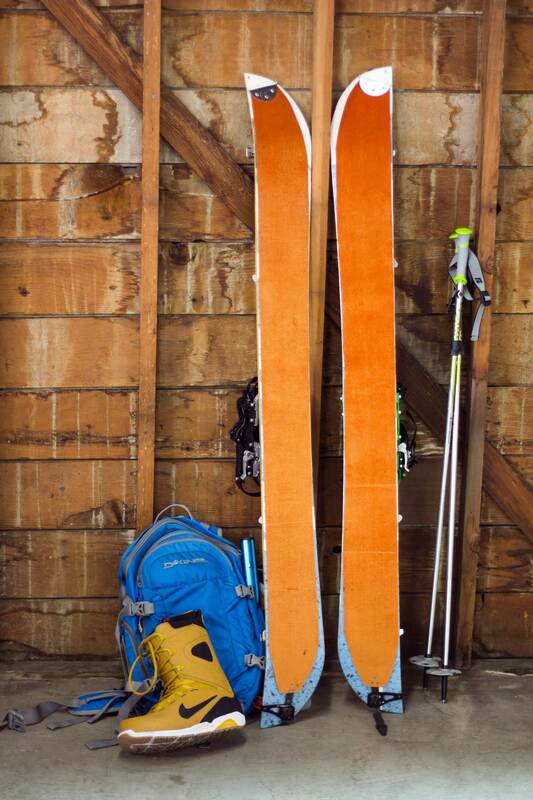 A spiltboard is a snowboard that has been cut in half vertically to make two “skis.” With these skis, you can hike up into the backcountry using climbing skins, think of a more EVOlved snowshoe. Once you have reached your desired peak, attach the skis back together and you’ve got a board to shred down a pristine (and hopefully powder filled) run. Splitboarding is the snowboarder’s key to accessing backcountry terrain. 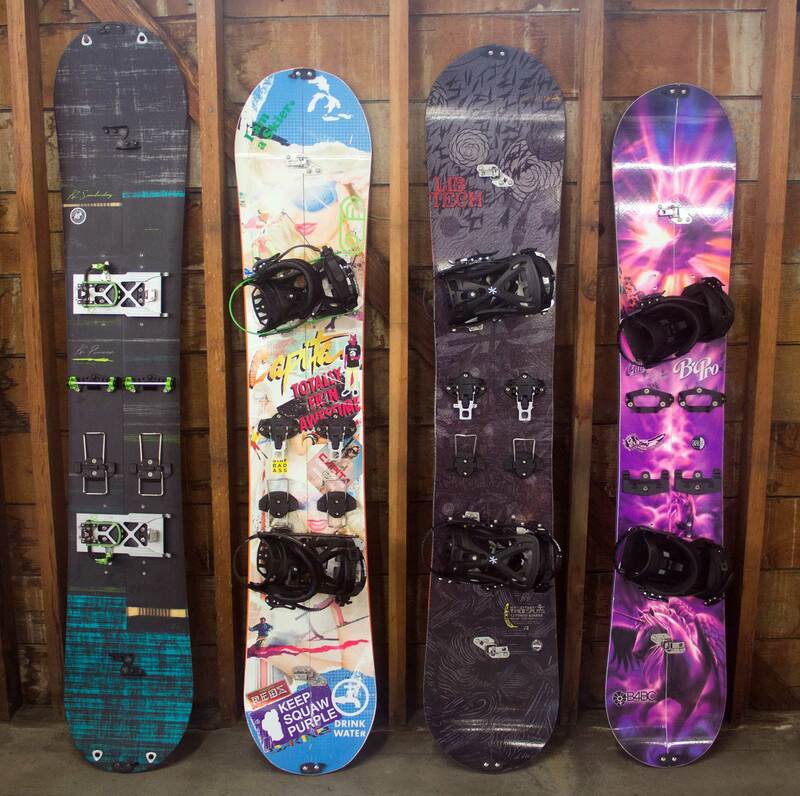 There are a plethora of splitboards available now and more coming out each season. Offered in a selection of camber profiles and shapes by most of your favorite snowboard brands, factory made splitboards are a great option for those ready to get after it. With a sealed inside edge, factory inserts and pre-installed clips, factory splits are not cheap, but they’re ready to take on the backcountry right out of the box. If you are handy and have the right tools, you may want to consider building your own splitboard, with either the Voilé or Karakoram do-it-yourself kits. With a skill saw, electric drill, and a set of cojones, you can turn your favorite snowboard into a killer backcountry tool. While not for the faint of heart, splitting your own board allows you to choose your desired shape, camber profile, and flex. (Note: When you cut the board in half, you lose stiffness; take this into consideration when contemplating a DIY split). 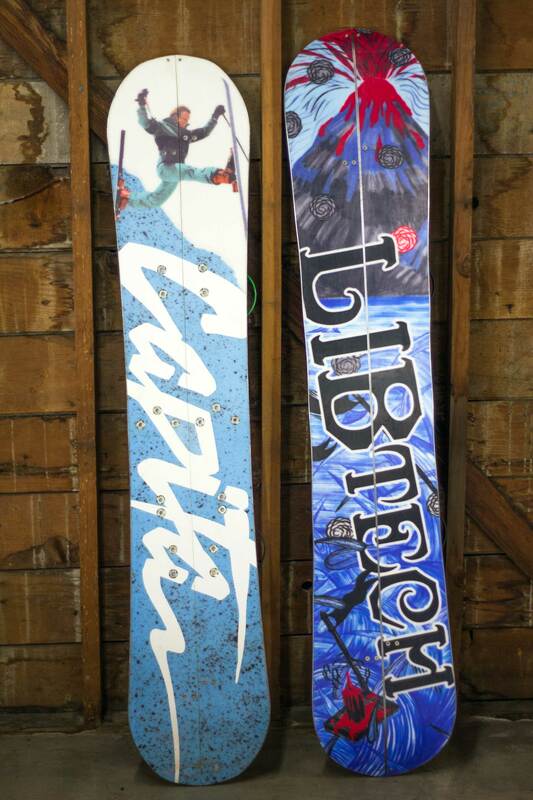 Boards like the CaPiTA Charlie Slasher and the Salomon Sickstick now feature an ABS sidewall insert down the centerline of the board, which allows you to make one sturdy DIY split without the worry of potential water damage to the core. Choosing the right splitboard is similar to choosing a normal snowboard: you want to pick a board that suits your weight, ability, riding style, and the terrain you will be riding. Consider that you will be taking this board on different terrain than you would take your regular snowboard. There are no groomed runs in the backcountry. Splitboards of all shapes and sizes, for everyone! Searching for untouched winter pow? Size up and find a board with some form of rocker; doing this will allow for more float in deep snow. A board with a tapered tail is a great option as well because it allows the tail to sink into the snow and the nose to rise above. Freestyle fun? Look for something that is twin shaped for riding switch. While you don’t necessarily need to size up, it may help if you plan on getting tricky in the pow. Boards based off of freestyle classics or DIY splits are a great option here. Turns all year? In search of gnarly lines? Directional and stiff are your friends here. Look for something with some camber under your back foot for maximum power and control and rocker in the nose to stay afloat in deep snow. Don’t feel like you have to compromise and buy a smaller men’s board. Most companies are offering women specific splitboard designs, with narrow waist widths, smaller sizes and softer flexes. From freeriders to freestylers, there are different shapes and camber profiles to meet every lady’s desire. The interface is what connects the bindings to the board for both touring and riding. There are two main interface systems: the Voilé puck system and the Karakoram system. Voilé puck system on the left, Karakoram system on the right. The Voilé Puck system consists of four pucks that are attached to the inserts. For ride mode, the bindings slide over the pucks and are locked into place with a pin. In tour mode, that same pin creates a pivot point, allowing the heel to be free for longer strides. There are a couple of different bindings that will work with this system. Splitboard specific bindings designed by Spark R&D, Voilé, and K2’s Kwicker will work with the puck system. If you don’t want to opt for split specific bindings, the Voilé Sliders allow you to use your traditional bindings while splitboarding. The Voilé pucks are not included when purchasing bindings. The Karakoram system is designed to work with only Karakoram bindings. It consists of four metal plates that join the splitboard together using the bindings’ lever and pin system. This active joining technology creates a feeling similar to a solid snowboard. In tour mode, the toe piece of the binding locks into the touring bracket, and with its sleeved axel, it creates a pivot point necessary for touring. Also, this interface allows you to lock the heel of the binding, which is unique to Karakoram. This allows for side-stepping gnarly terrain and skating out of flat areas. The Karakoram interface is included with all Karakoram bindings, which is reflected in their pricing. Although using your regular bindings in conjunction with the Voilé system is an option, we highly recommend investing in a pair of splitboard specific bindings for several reasons. Because splitboard bindings are specifically designed for backcountry use, they are generally lighter and more durable than regular snowboard bindings. Aircraft grade aluminum and carbon fiber are materials Karakoram and Sparks R&D both use in their binding manufacture for durability and weight savings. Splitboard specific highbacks allow for increased range of motion while going uphill, and low profile designs reduce hang ups when striding. Furthermore, these bindings often tie into their corresponding interfaces with obvious benefits. For example, both Karakoram and Spark R&D offer bindings that allow you to lock the heel and skate, and also feature an incredibly simple and easy to use riser system. Finally, binding / interface compatibility typically reduces transition times when swapping from skinning to riding, or vice versa. Split hooks are designed to help hold the two halves of the splitboard together and provide increased torsional stiffness. Tip and tail hook clips are small plastic pieces that connect at the tip and tail. These play an important role in creating a supportive and solid feel, comparable to a normal snowboard. 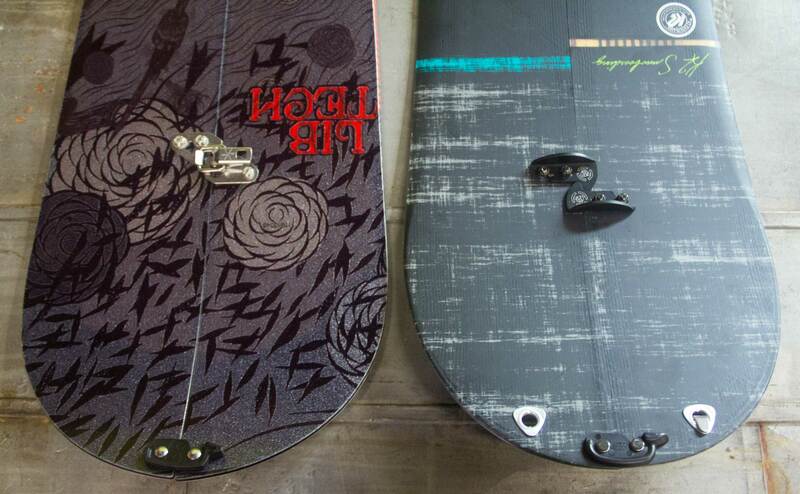 Split hooks and tip and tail clips are almost always included with factory splitboards. Karakoram and Voilé offer their own versions of split hooks. Arguably the most important part of the splitboard setup, climbing skins provide the traction necessary to tour uphill. Skins are strips of adhesive-backed fabric with tiny hairs pointing towards the tail of your splitboard. The hairs of the skins allow easy glide forward but prevent the board from sliding backwards in tour mode. Climbing skins attach to the board with adhesive glue, tip clips, and sometimes tail clips. Most skins are trim to fit, meaning that you have to cut both edges of the skin to match the sidecut of the snowboard. However, more companies are offering pre-cut skins for their splitboard lineup. Manufactured by companies like Voilé, K2, and Spark R&D, skins are a necessity for any splitboard setup. Remember, climbing skins made for skis will not fit splitboards! Purchase splitboard specific skins for proper coverage! NB: These guides were written with skis as the primary example. When reading, interpret a 'ski' as one half of your splitboard! You never know when you’ll need crampons. They may sit in your pack for weeks, but once you hit that last icy peak, you’ll be glad you packed them. Instant traction in slick situations is never something you want to take for granted. 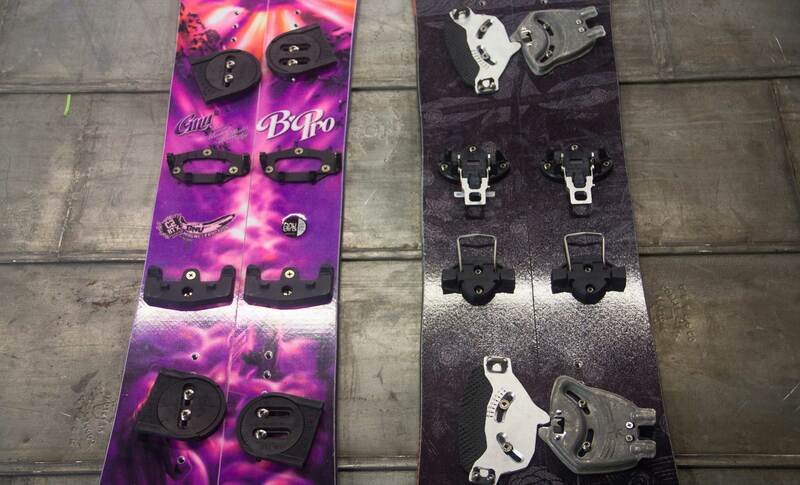 Every major splitboard binding manufacturer produces a crampon that is compatible with their bindings. The crampons usually attach to the touring pivot point and float to provide a smooth glide followed by supreme traction. I’m a snowboarder, what the $@*# do I need poles for? While many snowboarders have little experience skiing, poles are a must for skinning up the mountain. They provide balance and let you push with your arms when travelling over flat or rolling terrain. We suggest that you take a look at three or four section collapsible poles. They fold down to a manageable size to store in your pack for the shred down. Check out Black Diamond, K2 or Voilé for a reliable pair of 3 or 4 poles. Can I downhill ski with my split? No. While you can throw some mellow telly turns while touring and safely slide down easy rolling terrain, splitboard bindings while in tour mode are not designed for the stress of downhill skiing at speed and the one-sided sidecut isn’t designed for turning. Karakoram offers a locking heel in tour-mode, but this is used more for skating out of flat spots and sidestepping or sideslipping in gnarly terrain. Can I use my normal boots in a split binding? Of course! No need to worry about breaking in new boots; your everyday snowboard boots will work just fine. However, serious splitters prefer a laterally stiffer boot for more control while touring. And then there are hardbooters, who actually use a soft flexing alpine touring ski boot with Dynafit alpine touring ski binding toes for the skinning portion of their trip and a plate binding for the descent. Can I use my splitboard for riding lifts at the resort? No problem. While splitboards are generally heavier than your normal resort set up, they will ride just fine inbounds. You may notice some extra chatter or flex on hardpack, but on a pow day, splits kill it and you always have the option to tour out of bounds as well. Does it ride like a normal solid snowboard? With recent advancements in technology, splitboards are coming closer to riding like solid boards, but still aren’t quite the same. Factory splits are built torsionally stiffer to compensate for the reduction in rigidity, and new clip designs hold the board together more tightly than in the past.